If you already have an existing earlobe piercing then why not try something from this range of fake tapers and plugs. They look like standard ear stretching tapers and plugs but use a 1.2mm (16 gauge) ear piercing. 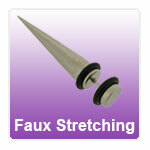 Fool your friends into thinking you have stretched your earlobes with with these range of faux stretching jewellery. "Excellent service, great product, fantastic price, speedy delivery"
"The best place to shop for all Piercing is Jobananas Iam so so happy with their product...I dont know if i can stop shopping great quality and fast..."
"Great service! Fast delivery! Ace quality! Highly recommended! A***"
"Thanks very much for the excellent service and great products." "Bought a ring on ebay and that is excellent then found the website which is fantastic, huge choice and in larger gauges which I was looking for...."